Inexpensive Monitor Stand with Bracket for 50" TV Manufacturers Inlcudes Everything Needed in a Trade Show Display! This Monitor Stand with Literature Racks is Superb! Buy Online Today! This monitor stand, also called a banner stands, features a hard-sided carry case that makes it easy to keep parts together for storage and transport. This carry case comes with a wrap and table-top counter design that allows it to be used as an additional selling counter. The transportable monitor stand has (2) kidney-shaped counters that are ideal for providing printed information to potential customers or displaying sample merchandise. In addition to the large aluminum stand, (2) magazine racks are included. These top-quality portable brochure holders adjust to three different heights, and have (6) pockets that are sized to hold catalogs, magazines, and other literature. The carry bags included with each of these racks are specifically designed to make transporting the units from show to show easy. 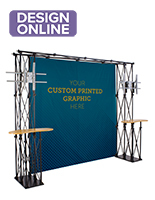 Buy a tradeshow display at some of the lowest price found online now! This monitor stand is sure to leave an impression at any location. The large aluminum display captures attention immediately, and other great features will captivate attendees. 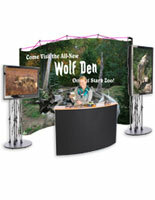 The monitor stand has a large 8' x 8' graphic featuring your custom designed imagery. The fabric graphic attaches to the aluminum booth with 11 hook-and-loop 2" x 2" squares. This monitor stand designed for 50" TVs and smaller mounts two (2) large plasma, LED, or LCD televisions on either side of the unit. These televisions can be up to 50" in size if they weigh no more than 80 lbs. The aluminum monitor stand mounts the TVs in either horizontal or vertical orientation. The hardware needed to mount your television to the stand is included, though some TVs may need special screws that are not included but are available at any hardware store. This monitor stand is designed to hold a variety of television brands including NEC, Toshiba, LG and Panasonic. 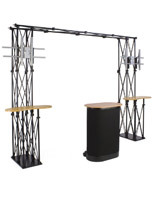 The durable discount monitor stand for sale with 50" wide screen televisions includes everything needed to set up a distinctive trade show display that gets noticed. Buy just one or buy in bulk!